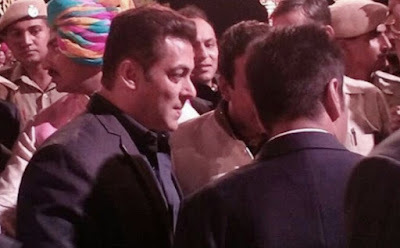 Bollywood superstar Salman Khan attended marriage ceremony of Nepalese businessman and industrialist Binod Chaudhary’s son Varun and jeweller Rajkumar Tongya’s daughter Anushree. Other VVIPs present in the grand ceremony were Sri Lankan Prime Minister Ranil Wickremesinghe, ace fashion designer J.J. Valaya, filmmaker Muzaffar Ali, Shatrughan Sinha, superstar Rajnikanth’s wife and film producer-playback singer Latha, former President of Bangladesh Hussain Muhammad Ershad, Filipino politician Ferdinand Marcos, President and CEO of Forbes Michael S. Perlis, Indian politicians like Kamal Nath and Digvijaya Singh and others. The wedding took place at Jag Mandir continuing from Friday night to Saturday morning, saw a bevy of celebrities mixing with the royals of Rajasthan, dressed in their best. Salman Khan was clad in a simple black suit, attended the venue just for a few minutes with a dozen of bodyguards and police officials protecting him from the guests who were clearly the star’s huge fans. Salman just meet and greet the bride and groom. Devotional singer Prem Khushwaha played the live music at the wedding.